This is a leaflet from the 'Inventional Exhibition' in 1885. Technology developed dramatically during the 1800s and inventions and gagdets were very popular. After the tax on newspapers was lifted much larger and much longer newspapers were printed and distributed across the country. 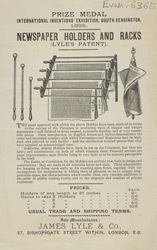 This newspaper holder (which is still used toady in libraries and public houses) was very useful as it meant that it was easier to read the newspaper as all the pages were kept neatly in order.